This lady had been wearing a large upper denture for a number of years. She disliked the way it looked and particularly the she disliked the ‘gagging’ feeling it gave her, since it completely covered the palate. The last remaining tooth helping to hold it in place was in imminent danger of falling out so we discussed what the options were. finally the implant denture can be made ‘as one’ by a skilled denture technician using off the shelf teeth, so compared with a complicated implant bridge where every tooth has to be painstakingly made from scratch the fabrication costs are also much lower. On average, the implant retained denture costs half what a fixed implant bridge would. The disadvantages are that it must be removed for cleaning (as it is not ‘fixed’ like real teeth) and it is bulkier than fixed implant-bridge teeth. 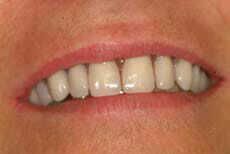 However, in this instance it provided the best solution for the client, who was used to wearing dentures.